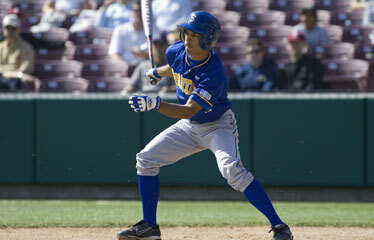 Mililani graduate Chris Balatico, who is batting .329, is the No. 1 hitter in the Spartans lineup. The defense never rests at San Jose State, and that's fine with Chris Balatico. "Our coach (Sam Piraro) is old school. He's been doing this for 30-something years, and one thing he strives for is perfect defense," said Balatico, the Spartans' starting senior center fielder. "He recruits guys who can catch the ball. We work hard every day -- reps, drills, tedious things, small details. He cares a lot about defense, because pitching and defense will win games." Balatico, a 2003 Mililani graduate, and freshman infielder Brett Hasegawa, an Iolani alumnus, are here for San Jose State's series against Hawaii. The first of three Western Athletic Conference games is tonight at Les Murakami Stadium. 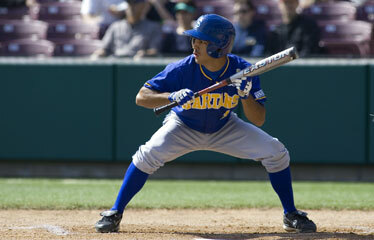 Balatico said defense is stressed so much that sometimes the Spartans go a week without batting practice. "He'd rather have us work on grounders, have the outfielders throw to the right bases," Balatico said. "It creates kind of a chip on our shoulder, but we really pride ourselves on our defense." But Balatico, who has gone from utility guy to vital cog, is also expected to provide offense. He has emerged as the No. 1 hitter in the Spartans lineup. He's batting .329 with a .432 on-base percentage. "He's established himself as our leadoff batter. His greatest asset is his speed. I've been trying to convince him for a year-and-a-half," said Piraro, who also had Balatico pitch last season. Last year, Balatico wasn't as patient at the plate, but he has improved significantly. "He made progress in the fall, and in January he made an even bigger jump. He works very hard in practice and it shows on the field," Piraro added. Balatico has developed his lead-off guy mentality. "For me, the main thing is get on. As the first guy up, you're first to see the pitcher. Your job is to get on, more than trying to hit doubles or triples. Work the count, see a lot of pitches. Set the table pretty much." His first role model for the top of the order was high school teammate Gainor Nitta. "I usually batted second or ninth in high school. Gainor was one of the best players to come out of Mililani," Balatico said. "Watching him I learned how to take pitches and be a difficult out." After Mililani, Balatico went to Hartnell College in Salinas, Calif. After two years there, he "wasn't ready to come home yet," and transferred to San Jose State. He's excited about his return to Murakami Stadium (Balatico played three games here last year) for obvious reasons. "I have nephews and nieces I don't get to see," he said. "Family's the reason I play. I've been spoiled throughout my life, and my family pushes me. If not for them, I probably would not have even gone to college. I want to do well and make them happy and give back to them."